This 225,000 SF commercial office building complex consists of a ground up 18-story office tower, located at 412 West 15th Street, attached to a newly reimagined building located at 413-419 West 14th Street in a landmark district building in the Meatpacking District of Manhattan. Together, the buildings will serve as an innovative office community with flexible meeting and work space, communal indoor/outdoor environments that maximize river and city views, and opportunities for food and beverage venues. The architecture and interior design take their cues from the existing neighborhood fabric, responding to the vibrant spirit of the Meatpacking District; creating a new office building that harmonizes and enhances its context. 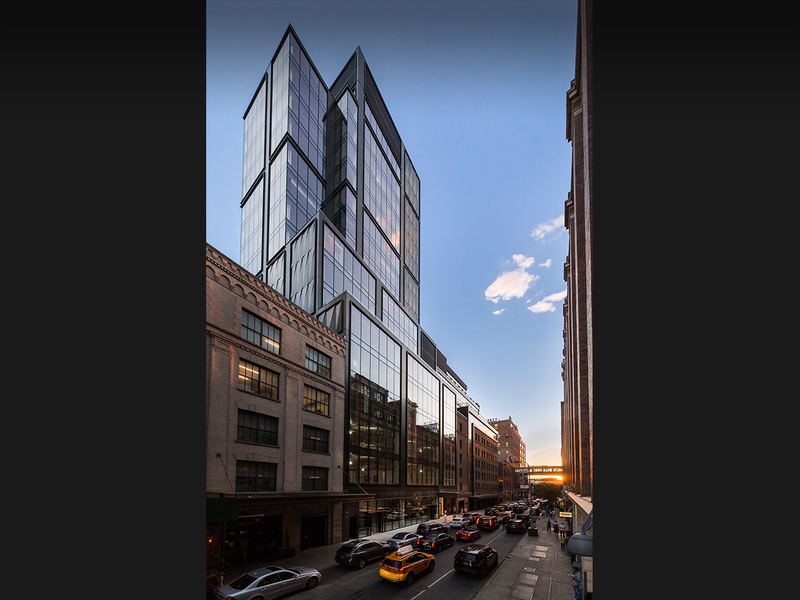 The new office tower’s sleek façade of glass and custom, sculpted three-dimensional metal panels imported from Italy merge with the adjacent historic structure on 14th Street, which has been adapted as part of the office complex. Five outdoor terraces and a sixth terrace on the top floor of the new tower offer opportunities for working, meeting and relaxing, and take advantage of the city and river views while also drawing a parallel to the nearby Highline Park. Within the tower, the nearly column free floors and high ceiling heights offer highly flexible and open floorplates, allowing unlimited possibilities in workspace interiors for tenants. The connection to the outdoors through full height glass windows, terraces and flexibility of space leave behind traditional notions of office environments and offer opportunities to integrate a productive work environment with play. View the project video here.